Am I dense? Or is it this recipe? I hate to come back to this blog on a negative note, but with two kids under three, I don't make a lot of ice cream anymore. When I do make ice cream, I want it to work. 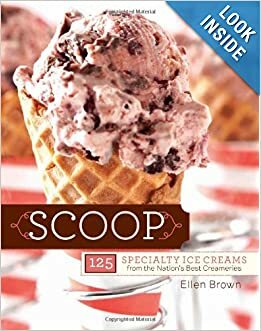 Twice, I have used chocolate ice cream recipes from Scoop: 125 Specialty Ice Creams from the Nation's Best Creameries and been super frustrated. The ice creams tasted great when I made the base, but they were so darn thick they just spun and spun in the ice cream maker, not getting cold, just attaching to the dasher. Is it me? Am I doing something wrong? I know I did do one thing wrong this time but I can't imagine it would have been the result of my base refrigerating into one gelatinous blob. My mistake (and yes, I know the saying ab out blaming one's tools, but I also know as a graphic designer, I think they made a poor design mistake...) was that I missed adding the heavy cream at the beginning. Why? Because when they list the first step, they try to be all fancy with their design and bold the first couple of words and first ingredient. It pulls that first ingredient out of the list of other ingredients and combines it with the action...at least it does for me. I have attached a screen shot from the Amazon preview of one of their other recipes for you to see what I am talking about. See, don't you miss the cream? Maybe it's me. But to me the design just doesn't work in that way. But I digress because I did add the cream, albeit later, but that shouldn't make much of a difference because my dear favorite ice cream authors in The Ultimate Ice Cream Book: Over 500 Ice Creams, Sorbets, Granitas, Drinks, And More add the heavy cream at the end all the time and they never have gelatinous bases! 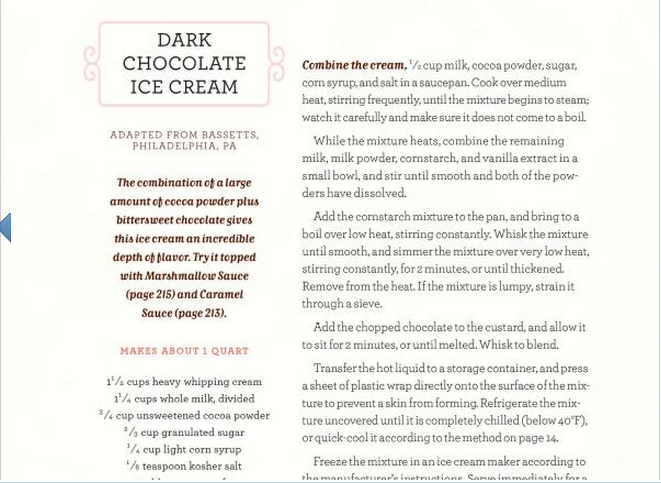 The first time I made a chocolate recipe from this book, I looked at the base and I thought it was just too dense. I have a note in the book that I added an extra half cup of both whole milk and heavy cream and it worked out just fine. However, this time, I thought to myself that maybe it would work, maybe I should give it the benefit of the doubt. Nope. I even tried stopping the churning a couple of times to push the mess back down with a spoon. And you know what happened? The ice cream froze to the side (finally) but ended up freezing too fast that the dasher got stuck and wouldn't turn anymore. I want to love this book. The concept is great. I just can't see how these recipes made it into the book. Did someone not test them? Did someone leave out some liquid in the typesetting of the book? Again, maybe it's me. I have taken quite a hiatus but I would like to think ice cream churning is like riding a bike. I'm interested to see if anyone else feels this way about the book. And I am sorry, Jackie, your present is to come because I just don't want to give you a solid block of frozen chocolate. In the meantime, you can tell me what your favorite flavor is.